Say you have a Nissan GT-R, and 480,530, or 545 horsepower just isn't doing it for you, and you want a little more. Just enough for a little more motivation. Then these two kits are not for you. If you want twin turbo Lamborghini slaying, Bugatti Veyron walking, turbo Hayabusa killing power then the Alpha 10 or Alpha 12 kits are for you. The kits have been around for a while, but are just now going into final production with the cast exhaust manifolds. Why cast? Cast manifolds last, and stand up to the abuse much better than most tubular header style manifolds. There is a slight weight penalty, but I will give up that weight for the robustness of a cast manifold. So if you want to make 900 wheel, 1200 wheel horsepower, then AMS has your turbo kits. At those kind of power levels, you need to upgrade the engine, trans, and even the driver to handle the power, but if its something you need to have, then the turbo kits start at just $15,500. Any doubt on exactly how fast you can go on an Alpha 12 kit. One of the latest 8 second street cars from Ivey Tune. The Alpha GT-R Turbo System is no one-trick pony. Often bigger turbos require you to give up much of the low and mid-range power. While others might use the "bigger is better" approach to turbo kit "design", we set out to properly engineer a system that yields maximum power across the WHOLE power-band to keep you ahead of the competition. By applying the latest in billet wheel and V-band turbo technology we set the bar even higher. Billet compressor wheels are not only lighter, which helps quicken your turbo spool time, they also have superior aerodynamic profiles that compress more air efficiently: less heat = more power. When Motortrend http://blogs.motortr...a-12-22571.html tested our Alpha 12 they were blown away by the throttle response. They felt "The quickness with which the turbos spooled was breathtaking." When it comes to casting, those aftermarket companies who are willing to make the investment, choose a log-style manifold due to its simplicity and smaller size. These are much easier and cheaper to produce because little effort is spent in the "design" of them. While log manifolds are much stronger than a hand-fabricated design, they disturb exhaust flow and hurt performance. 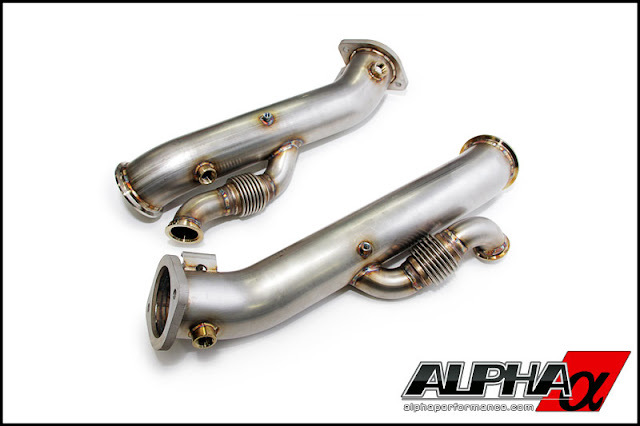 Our team of engineers designed the Alpha manifolds with a cast AND tubular design giving you the best of both worlds. By implementing CAD (computer aided design) methods our turbo system offers you even better performance benefits than an equal length, hand-fabricated manifold with the strength of a cast manifold; something not offered by our competition. By casting a computer designed, tubular manifold, we were able to maximize exhaust flow with massive 1.5" exhaust runners while utilizing the small space available in your GT-R's engine compartment. To top things off, we even Extrude Hone each manifold to ensure you unmatched performance. 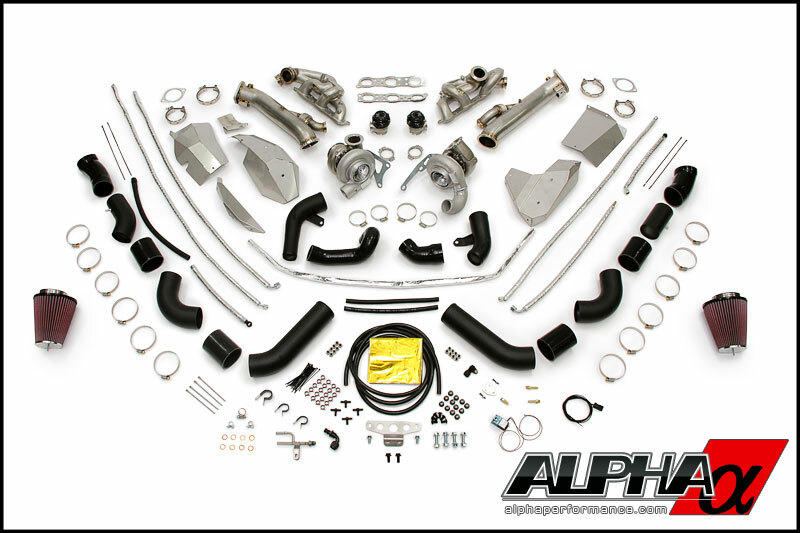 ALPHA Turbo kit complete hardware system for seamless install.